Very often we face widespread and strong but erroneous opinions and judgments about a phenomenon, an event, and in some cases, even a whole country. Unfortunately, often we don't realize the enslavement of our minds by these stereotypes, misinterpretations, myths, and dogmas. Sometimes it happens because of our limited knowledge about some perception; sometimes it is done deliberately. As a result, those "myths" and stereotypes become an influential part of our judgment and beliefs. The purpose of this page is to collect the most common stereotypes and myths about Uzbekistan that question its good name and to destroy them with true facts and strong arguments. Unfortunately, many residents of the USA and Europe believe so. No, ladies and gentlemen, the ending "-stan" simply indicates its eastern origin. In no way does it imply any political affiliation with those well known states. Uzbekistan is a sovereign and independent state that emerged from the Soviet breakup. Uzbekistan is one of the republics of Central Asia. Period. This statement is as far from the truth as the Earth is from the Sun. Though Uzbekistan is predominately Muslim, about 88%, it represents other faiths as well. All people have freedom of choice. The remaining 12% of the population are Russian Orthodox, Catholics, Protestants, and Jews. And some people, as Vysotsky used to sing, "don't believe in anybody, not even in hell.". These two stereotypes, related to each other, are very widespread among those who don't know much about Uzbekistan. Surprisingly, these stereotypes have been spread not just among westerners, but among fellow former Soviet citizens as well. Internet resources have played a big role in promoting this stereotype. They state that Uzbekistan is "a conservative country with Muslim traditions, and therefore the garments are conservative as well. That's why men and women wear pants and long sleeved shirts". They who say this have never been to Uzbekistan during the summer, when every other citizen wears shorts, breeches, and open shirts. Yes, one can meet people in national dress, but that's why it is called national, so people wear it on special occasions. As for paranja, many young people don't even know what that is. Our women don't wear paranja! They don't hide their natural beauty and grace! One can meet few religions women with their heads covered. As for the majority, they dress more European: jeans, shirts, and t-shirts. What's more, we wear short skirts. Everything is contemporary, according to whim and style. No Middle Ages and no conservatism! Why? Many countries would envy the stability of Central Asia and Uzbekistan particularly. There are no wars, coups, revolutions, riots, and destruction. Bullets don't fly overhead, and bombs don't explode in the streets. Nobody attacks the travelers, and nothing threatens their lives. We don't have terrorism! Thank Allah, Gracious and Merciful! Why is there a rumor that we have a critical situation here? The People of Uzbekistan are known for their peacefulness; nobody has a habit of using guns for any purpose. The traditions of hospitality are strong and unshakable. As a result, it is quiet in Tashkent - and in any other city in Uzbekistan it is very quiet too. Thanks to the above-mentioned rumors and tales, many people have a strong impression that a carriage pulled by a donkey is the only way to travel in Uzbekistan. This funny eastern combination that amuses many can rarely be found in town, and mostly in rural areas. In the streets of our cities with developed infrastructure, one can't find anything of the sort, except in a few exceptional cases. Another stereotype is that there are no cars of famous make in Uzbekistan. You might be very surprised, but we have more than our share. Moreover, at the UzDaewooAuto factory in Asaka, we produce cars that are exported to Russia, Ukraine, and Kazakhstan. Uzbekistan also produces airplanes such as the IL-76MF, IL-114, buses for Isuzu, and tractors for Case, etc. This is Uzbekistan! 6. The majority can't speak Russian, and don't know foreign languages Foreign languages are not the strongest trait of the Uzbek people, indeed. But recently the study of languages has become very prestigious. The courses offered are attended by thousands of young people who are willing to learn and use their knowledge. Many students take classes in foreign countries. Believe it or not, Uzbekistanis solve this problem much more efficiently than Italians or Spanish who find any foreign language at any level difficult. As for Russian, it is simply strange to say that nobody can speak it because Russian is the language of international communication for Central Asia. About 80% of the population can speak it in the countryside, and almost all in the multinational capital of Tashkent. The number of bi- and trilingual people in Uzbekistan is impressive; one won't have a problem communicating. The majority of commercial banners and advertisements are in Russian and some - in English. There is some truth in this statement. But again it is awfully overstated as with many other stereotypes. 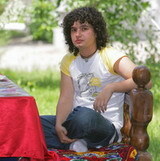 Tables on short legs are widespread in Uzbekistan, called dostorhon. People sit on traditional mattresses called "kurpacha" that are spread out on the floor. This tradition does not allow one to assume that the whole population dines in this manner. There is another tradition of eating pilaf with our hands. One can assume that other meals are eaten without silverware. Is it possible that some believe that one can eat soup without a spoon? This could have been the case years and years ago before spoons and forks appeared in Uzbekistan. Today every citizen uses silverware. This tradition is more of a show for travelers who look for archaic cultural-ethnic differences in the rural areas rather than everyday reality. Is there anything more naive? Is there any way that the whole population of 26 million is trading in the markets? Who would work in the heavy industries? Who will build houses, plough the soil, drive, teach the children, and so on if everyone is behind the counter? Many people are involved in commerce but one cannot generalize to that extent. This is absolutely not true. Uzbekistan has its own night life. People attend bars, clubs, cafes, restaurants, and other places of this kind. There are quite a few of them in Tashkent, from modest to huge. They offer various types of entertainment for their different clients. Some of them close at 11:00pm or midnight, but many stay open until morning. The entertainment industry is not that different from other post Soviet republics. Casinos and gambling are not common things in Uzbekistan, however. Late night walks in the streets are not a major part of the night life in Tashkent either. According to statistics, Uzbekistan has 265 sunny days. You must agree it is more than a few, but there are still 100 days left in the year. Therefore, it is not sunny all year round. And it is definitely not warm all year round. The hottest days are in the summer months, of course. The range of daily temperatures for those days varies between +350C and +450C. The autumn is somewhat warm. The temperature is about +130C. in winter, and it rains and snows a lot. The snow might not melt for weeks. The people of Uzbekistan are used to that. In winter the temperature can be as low as -100C. The yurt is a wonderful summer residence and is set up in many backyards in rural areas of Uzbekistan, Turkmenistan, Kazakhstan, and Kyrgyzstan. Cities have their own unique architecture due to the specific seismic activity in the region. This is the main reason why there are relatively few towers and high buildings. 4-5 story buildings are the most common. The private sector is represented by specific buildings that remind one of the European mansions and palaces of old times, sometimes romantic, and sometimes fantastic. The overwhelming number of regions are not a threat to your health. You most likely won't get sick if you wash fruits, vegetables, and your hands before eating. Minor stomach problems can be caused by stored water that is high in mineral salts. People who are not used to the food might get an upset stomach. But this problem is not great enough to be of severe concern. Compared to Bukhara, Khiva, and Samarkand there is nothing to see, but Tashkent has a few historical monuments that are worth your attention. They are not as ancient, but Tashkent is a capital, a modern city. It has its own history, views, name, and sights that you will find interesting. One can be assured that Tashkent is not the dullest place in Uzbekistan. This is so absurd that few people believe it. Just to remind you, Uzbekistan has always been distinguished for its hospitality and kindness. We are happy to see all guests: Russian, English, or Japanese. A guest is something revered in the East. As for Russians, local people would enjoy their company for the absence of the language barrier and for the presence of a common soviet past. Therefore, those sorts of beliefs have no truth behind them. This stereotype has existed for centuries. Fortunately or unfortunately, it is not true. It is well known that, according to the Holy Koran, a man can have four wives, in the case of his ability to support them all in relative prosperity. Not all Muslim states allow this. For instance, there is a separation of church and state in Uzbekistan, but some countries where this isn't the case still do not allow polygamy, such as Tunisia. In reality, however. This is a delicate matter and exceptions happen. As for the belly dancing, it is hard to say. Remarkably, the interest of the public in belly dancing has increased in recent years. The demand for skilled dancers is high. This is a very prevalent misconception. Actually, in Uzbekistan and other countries in the East women are highly respected. More respected than in many families in other regions. Men will give up their seat on the bus, help carry heavy bags, and listen to women's advice. You won't hear "Shut up, woman!" anywhere. It may sound strange to a western ear, but there is a hidden matriarchate in the East. Of course men always have the last word, but the saying that the "man is the head, and woman is the neck" is fitting. This misconception is a continuation of the previous one. According to the facts, in Uzbekistan 17.5% of female political scientists are women. So we are third in the post Soviet region, after Belarus, and Latvia, with 29.1% and 19% respectively. Russia comes in fifth with 9.8%. No comment! It is hard to imagine, but there are: natural and dyed, of all ages, occupations ethnicities, and religious beliefs! Most of them live in Tashkent. One can meet them day and night. The myth of the absence of blondes in Uzbekistan will be dispelled right upon arrival. By the way, many foreign men find them "very beautiful indeed". Of course, they are beautiful, bright, hot, joyful, and very charming! To disagree is to be of poor sight or taste. In many countries in the world, men and women have equal rights in the consumption of tobacco and alcohol. Uzbekistan is no exception in this matter. But once again, one should avoid hasty generalizations. Whether a woman uses alcohol and tobacco or not varies from case to case, depending on her taste, religion, health, etiquette and preferences. Therefore, make sure that the woman won't be offended before offering a cigarette or a drink. By the way, not all men drink alcohol on every occasion. No more than in any other country. Neither in Asia nor Europe can one be safe from the unpleasant experience of having their belongings stolen. Be vigilant everywhere, all the time. Therefore, you will encounter many warnings not to carry large amounts of cash. Keep your valuables and documents in a secure place. In all tourist areas, one can fall victim to scams or pickpockets. After a quick research, one can be see that this myth is completely wrong and has no factual basis. Let's consider several examples. Hotel Amulet Madrasa in Bukhara, which is located in an ancient madrassah, has utilities, shower, and hot and cold water in every room. A Single bedroom costs about US$ 30, and a Double costs US$ 50. Hotel Malika in Samarkand offers a Single room for US$ 30, and a Double for US$ 45. These hotels are wonderfully decorated in national style with good food, service and personnel, located in the very heart of the tourist cities. Continuing our discussion of hotels, it is remarkable that the low prices do not add up to bad service, and the service at many is really outstanding. Upon the wishes of the client, the owners of private hotels will prepare Eastern, European, vegetarian and diet meals. In the so called mini-hotels the dinner might take place in the presence of the owner's family. The owners and personnel speak English, German, and Spanish. In some cases, they understand all the aforementioned languages. The overwhelming majority of clients are very pleasantly surprised with the service. As for the big hotels that are the part of global chains such as the InterContinental, Radisson Blu and others, their service satisfies international norms and Standards. That's a very interesting observation. Yes, many can be left with such an impression because of our warm and hospitable Oriental traditions. No talk would start a meeting without a cup of "peola" tea. It is a part of etiquette, of ritual. Considering that life in the East flows at a slower pace, then the "cup of tea" can last a very long time. If it comes to pass that another guest stops by before the first one leaves, and the host has to treat him or her in the same way. This all builds the impression that the house is always crowded. Holidays, the way we understand them, are not held as often as it may seem. Weddings and reunions- these are celebrated lavishly.